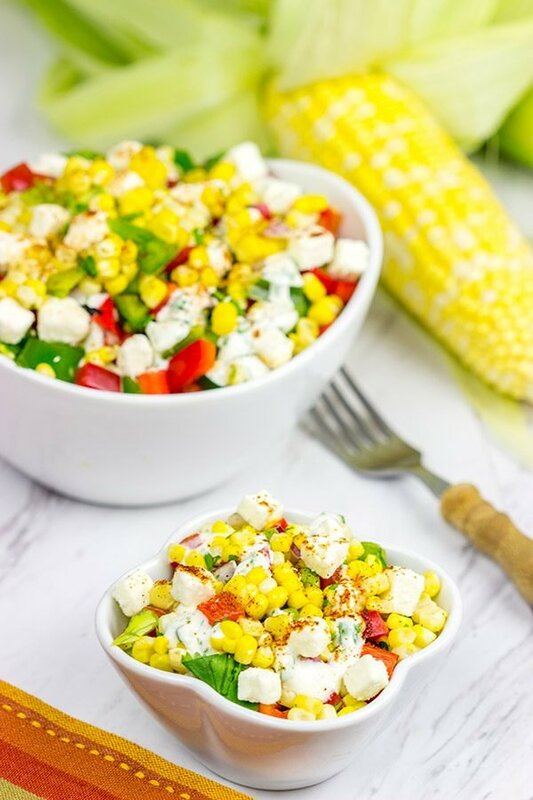 This Mexican Street Corn Salad is a fun twist on a delicious summer recipe! Whenever my wife and I visit another country, we always make sure to duck into at least one grocery store or market sometime during our trip. We like food (obviously), and it’s always fun to wander around a grocery store in another country. You stumble across very different ingredients and products. Or maybe very familiar products…just in different flavors. And then there was the Prawn Cocktail flavored Pringles. Huh? Shrimp cocktail in potato chip form? How is that even possible? We also stumbled across some familiar products…just under different names. Instead of pork rinds, we found this bag of pork scratchings. 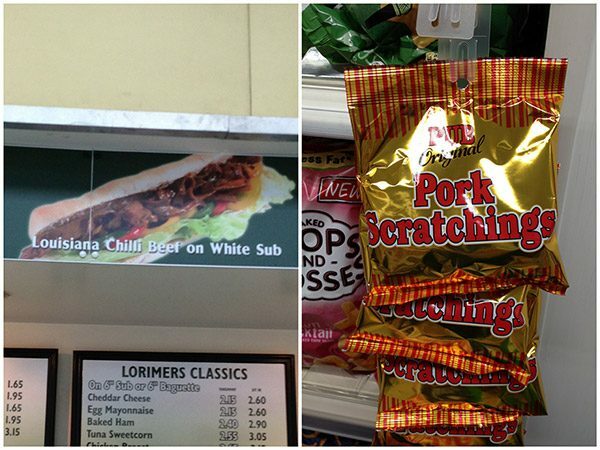 (Well, we assumed they were pork rinds…but now I wonder…) And the Louisiana Chilli Beef? What in the heck is that? I assume it’s a spicy beef sandwich? 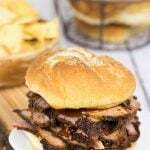 I lived in Louisiana for a while, and I never came across a Louisiana Chilli Beef sandwich while I was down there. While my wife and I haven’t been to Mexico together (we’ve both been, but it was long before we ever met), I suspect we’d enjoy eating our way across the country. I mean, it’s Mexican food! And Mexican food is delicious. 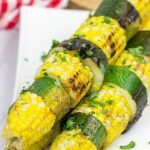 Grilled Mexican Street Corn is a favorite around our house in the summer, and we often make up a big batch whenever we have friends over. The other day, I decided to take that recipe and transform it into a salad. If you’ve ever eaten Mexican Street Corn, then you know it can be a bit messy. (Hey, some of the best foods are messy…I get it.) But this Mexican Street Corn Salad solves that problem. For this Mexican Street Corn Salad, I prepared the corn in the same way as normal. But instead of serving it on the cob, I sliced the corn off and mixed it with some chopped bell peppers. And of course, the dressing is an absolute must for this salad! 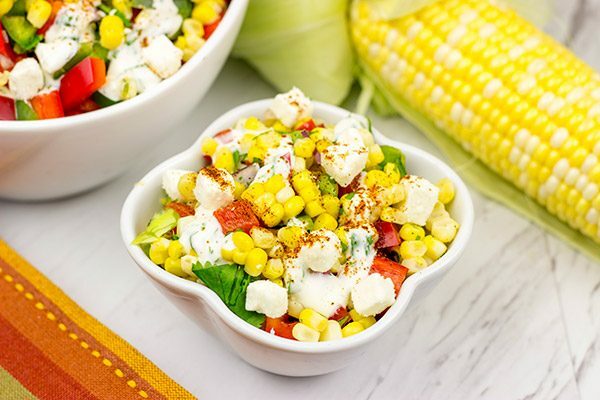 This Mexican Street Corn Salad is perfect alongside a burger or a piece of grilled chicken. (Say maybe this Margarita Grilled Chicken?) The fresh bell peppers and corn give it an amazing crunch, while the crema dressing adds a delicious tangy lime punch. Oh, and one more tip: go ahead and make a double batch of this salad…you’ll need it! In a large bowl, soak the ears of corn (husks on) for 30 minutes. Using a small bowl, combine the softened butter, lime juice, Parmesan cheese, salt and chipotle powder. Stir until well combined; set aside. Carefully pull the husks back from the corn, but do not entirely remove husks. Remove silk from corn. Rub the butter mixture evenly across the corn. Pull the husks back into place and tie closed with string. Grill the corn for 15-18 minutes, turning frequently to prevent burning. 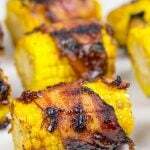 Once grilled, allow corn to cool slightly. Pull husks back and discard. Slice corn off cob and transfer into large bowl. Add diced bell peppers, onion and cilantro; stir until well combined. Meanwhile, make the dressing by stirring together the mayonnaise, crema, lime juice, salt and cilantro. Drizzle dressing on top of salad; sprinkle queso cotija and chipotle powder on top before serving. I love going into different grocery stores, David! Well, I love the grocery store in general, sooooo. There’s products in Canada that I don’t think you can get in the US too. Ketchup chips, for one. And Smarties which are something like M & M’s, but some people would beg to differ. We have pork scrunchions here in NL. It’s little tiny pieces of pork fat fried up to have with fish n brewis..ok, that’s another story…a very specific dish to NL. 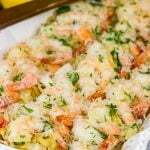 It’s basically salt cod and potato. I’m getting off on a rant, lol. Ok, now this salad! I absolutely LOVE corn and this salad is totally calling my name. That dressing looks awesome too! I could eat this one year round, for sure 🙂 Pinned! Have a lovely weekend! Hah! I love the grocery store, too, Dawn. It actually drives my wife nuts. I enjoy walking up and down the aisles and finding new, fun products. (And if I stumble across a good sale, that doesn’t hurt either!) I believe I know about Smarties…unless they’re different than the US version of Smarties. Either way, I’d love to wander around a Canadian grocery store sometime. Fun times! I love Mexican food, too, Kushi! I love all of the flavors, so I’m perfectly fine with combining them in all sorts of different ways. 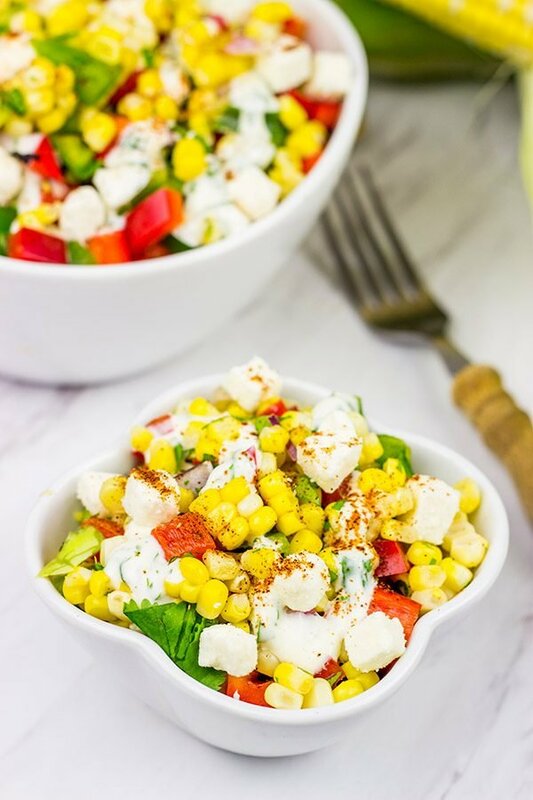 This corn salad is quite tasty…and perfect for summer picnics. I hope you enjoy it, and I hope you have an excellent weekend! Hi David! We are getting fresh local corn here and I could eat it every day, along with local tomatoes! This could used as a topping for tacos too. Kevin’s recent post would pair nicely with this! I’ve seen queso cotija at the Walmart here, but it’s not in the cheese section, it’s back in the dairy section near the butter and sour cream. I’ve been stocking up on local corn here pretty much every week, Dorothy! They’ve had it 5/$1 at the store lately…so yeah, lots of yummy corn. 🙂 Hmmm…good thought about the queso cotija. I’ll have to check in the dairy section. Perhaps we can get it up here, and I was just looking in the wrong place. Thank you! 🙂 I hope you and Gary have a fabulous weekend full of tasty treats! I love this deconstructed way of eating “street corn”! A true comfort food salad! Yes! Comfort food salad for sure, Mary. And it’s WAY easier to eat than the real thing. (Not that I’ll ever turn down some Mexican Street Corn…but the salad version is much easier to eat.) I hope you have a great weekend, my friend! I can be an incredibly messy eater (no matter how “neat” the food maybe, I’ll end up with a food-beard like I’ve seen Robbie sporting) so, this salad that takes chipotle-spiced-corn-on-the-cob off the cob and puts it into a salad is my kinda “good eats” like Alton Brown would say! I kinda wish I had brought home some of those Prawn Cocktail Pringles…but sadly I didn’t. Maybe I can get ’em on Amazon? Or maybe I just need to go back to Scotland! Yes, that’s it! Thanks, Shashi…I hope you guys have an amazing weekend! Talking about unusual food, few weeks ago I stumbled across a number of videos showing the people’s reaction on particular foods. 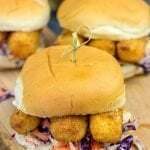 Let’s say the Irish first time ever trying some Azian snacks or the Americans trying Canadian street food, and so on. You know, that’s quite hilarious. I cannot say the same about this corn salad though because it’s seriously good. I wish I stumbled across this one right now…let’s imagine in a parcel you might have sent to me:) Well done, David! Mexico is one of my favorite countries as far as the food. 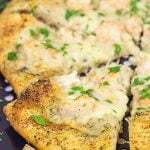 Italy is first, of course 🙂 it is definitely hard to find authentic ingredients in our area but it looks like you went and made something that tastes just as good as getting in Mexico! Oh, well that goes without saying, Ashley. Italy will always be #1 on my foodie list. In fact, I’m thinking it’s about time to eat my way across Italy again. And don’t even talk to me about ingredients…you have a Wegman’s. ‘nuf said. (Just kidding! We’re still in upstate New York…which sometimes feels like the boonies. Haha!) I hope you have a great weekend! haha those are some weird chips flavors! yeah it’s fun to see these random products in different countries, I do that too! love this salad, Mexican food is so wonderful so I am sure this must taste amazing! I absolutely love going into grocery stores in other countries. China was interesting. Those are some crazy flavors of chips you discovered! I also absolutely love Mexican street corn too and making a salad out of it is totally genius, my friend! This looks amazing! Oh, I bet China would be interesting! Do you speak Chinese? (Or rather read Chinese?) It’s fun wandering around grocery stores when you can read the products…but it’s actually more fun wandering when you can’t read it. Then you can just guess what it is! And then you can take a bite and be completely wrong. Haha! Thanks so much, Rachelle…I hope you have a great weekend! 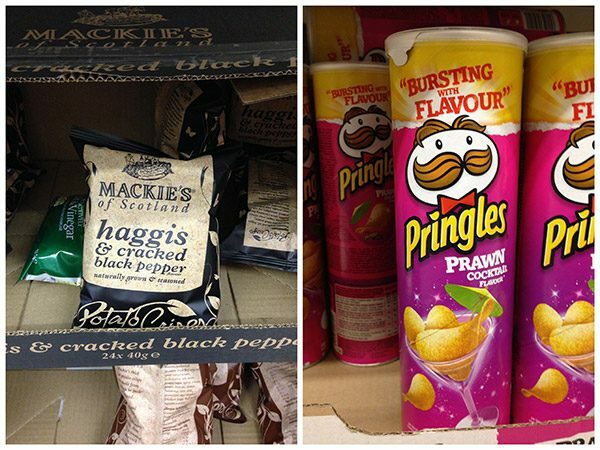 Haggis flavored potato chips? Yikes. My favorite was stumbling across Violet Crumble in Sydney. Those are wicked good. OK, you two need to travel Mexico, and go deep, not border. You’ll be in culinary heaven. Remember, if you never need Mexican ingredients I got the connects 😉 Ask anytime. Yeah, those were a bit of a shock to say the least! Violet Crumble? Never heard of it, but I’ll have to google it. I’m not sure how soon we’ll be able to travel deep into Mexico thanks to a certain little baby. But the good news is we can still nom nom some Mexican food and pretend we’re traveling, right? Thanks for the offer, Kevin, and I hope you two have an awesome weekend! Yeah, those chips. I can understand why they sell ’em in Scotland, but I’m pretty sure they wouldn’t be big sellers here in the States. Haha! Thanks, Kathy…I hope you guys have a great weekend! So….when will Australia be on the books, I’ll start hunting the goodies to consume 😉 I swear that is one of the best parts of traveling- The different snacks and also how they adapt certain foods to their culture- I once did a marketing assignment on ‘Chupa Chups’ (lol) and the company actually has different flavors in different countries because of their preference (e.g. China had green tea and more fruit flavors). Okay, that was random. Haggis….at least it wasn’t black pudding, gross! This street corn salad can rectify it..and a trip to Mexico! Hah! Well Kevin did mention that he found Violet Crumbles down there in your part of the world. Never heard of those! What about Vegemite chips? Is that a real thing? Oh geez…black pudding. That’s one thing I just can’t get behind. Hope you have a great weekend, Arman! I love proper sweetcorn and this sounds amazing. So many lovely colours and flavours. Part of the charm of Mexican Street Corn is getting it all over my beard, so your version will probably save me lots of embarassment. 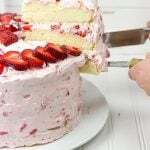 Plus, it looks very tasty.